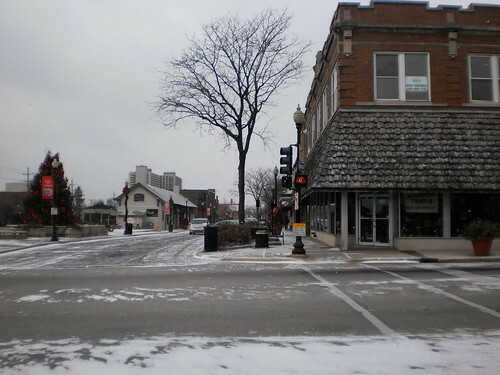 It's snowing today, the first measurable snow of winter 2010-2011. That's a nice way to begin December. It's not much, just enough to make roads slick and to pile up around the edges. It reminds me that I need to get salt for the front steps, but I can possibly put that off until the weekend. I started the month by getting legal again. My driver's license expired on my birthday. I've had the notice on the fridge since mid-October, but a number of things transpired against my getting it done before today. The first was, of course, finances. Even at a low rate of $30, that's $30 I don't always have. Second was the busy-ness of my life. Suddenly, I have to be out of the office doing things or in the office fielding phone calls. It has sort of slowed down but I'm still covering more things in the field than I have in the past year. Then the holiday showed up and they aren't open on my birthday. Monday, after work, the line was out the door so I went back on Tuesday, earlier in the day, but the result was the same, a line out the door. So, I went at 8:45 today and there were 4 people in front of me. It took all of 15 minutes. 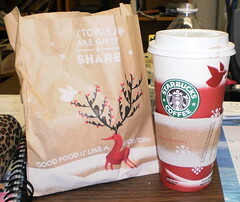 After that, I went across the railroad tracks to Starbucks for a hot beverage. For my birthday, my friend, Patt, gave me a Starbucks card. What a great way to celebrate being legal, a hot cocoa and a slice of their low-fat banana chocolate pound cake. The guy behind me in line said, "No!" when I took the last piece of cake. "That's his favorite," the clerk said. It was okay. I make better but it was okay. This is a good start to the month, knock, heavily, on wood. I'm legal again. I've had hot cocoa and pound cake. Thanks, Patt. We have snow that frosts the landscape and I have a bit more income incoming which will make this December less tense.